Thomas Hart Benton, City Activities with Dancehall from America Today, 193031. Mural cycle consisting of ten panels. Egg tempera with oil glazing over Permalba on a gesso ground on linen mounted to wood panels with a honeycomb interior. The Metropolitan Museum of Art, Gift of AXA Equitable, 2012. NEW YORK, NY.- American artist Thomas Hart Bentons epic mural America Todaya sweeping panorama of American life, celebrating the promise of modern industry and technology and the accomplishments of working people in the boom years of the 1920shas been donated by AXA Equitable Life Insurance Company to The Metropolitan Museum of Art. The announcement was made jointly yesterday by Thomas P. Campbell, the Museums Director and CEO, and Mark Pearson, AXA Equitable Chairman and CEO. .It was a new technique completely in mural painting, of actually taking reality and making mural art directly out of it. Although Benton received no fee for the commission, America Today established him as his eras leading American muralist. Its success provided the impetus for the Works Progress Administration (WPA) mural programs of the Great Depression. 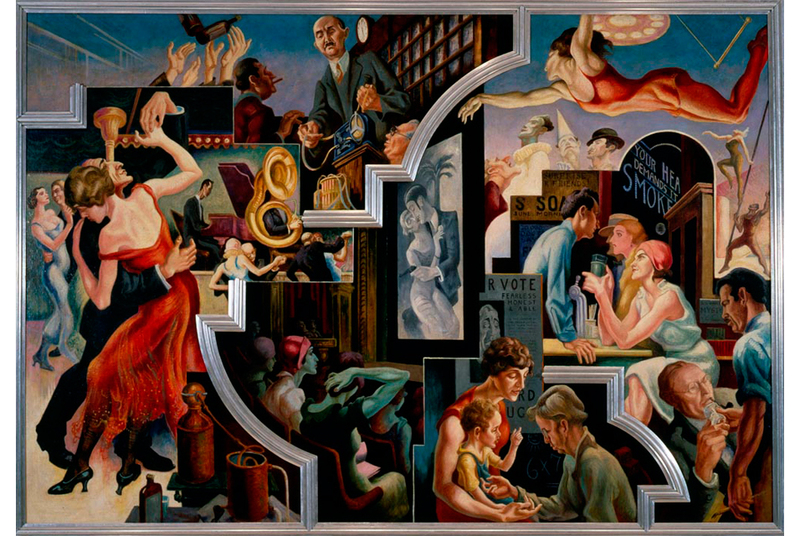 When America Today is installed at the Metropolitan Museum, its original spatial arrangement will be recreated so that the mural cycle can be viewed as Benton conceived it. After more than 50 years at the New School for Social Research in a room used first as the boardroom and later as a classroom, America Today was not receiving the physical protection or public attention it deserved. In 1982, the school announced the sale of the mural cycle to the Manhattan art dealer Maurice Segoura, with the condition that it would not be re-sold outside the United States or as individual panels. But the work proved difficult to sell as a whole and the likelihood increased that the panels would be dispersed. America Today was acquired by AXA Equitable (then Equitable Life) in 1984, after efforts on the part of then-Mayor Edward I. Koch and others to keep it intact and in New York City. Two years later, after extensive cleaning and restoration, America Today was unveiled to critical acclaim in AXA Equitables new headquarters at 787 Seventh Avenue. When the company moved its corporate headquarters again in 1996, to 1290 Avenue of the Americas, America Today was put on display in the lobby. There it remained until January 2012, when the company was asked to remove it to make way for a renovation. The removal triggered AXA Equitables decision to place the historic work in a museum collection. Curators Pari Stave, on behalf of AXA Equitable, and H. Barbara Weinberg, on behalf of the Met, were instrumental in moving the project forward. America Today was Thomas Hart Bentons first major mural commission and the most ambitious he ever executed in New York City. It remains his best-known work. Informed visually by Bentons characteristic stylized realism, America Today celebrates the development of new technology and of workers in all regions, from the farmers whom the artist knew as a native Midwesterner to steelworkers and construction crews engaged in building modern cities. Instruments of Power, the central and largest panel, faced the viewer entering the boardroom. Occupying the south wall, it extended almost from floor to ceiling and was bracketed by two windows that looked out onto the life of the city. Devoid of human presence, Instruments of Power announced Bentons passion for the Machine Age by juxtaposing icons of modern industry and transportation, including a rushing train, an airplane, and a dirigible. These and other forms declare that industry and technology will thrust America into the future.